I believe that we must discover our true gifts and talents and by being ourselves we shall bring about the positive change needed by our planet! I have been coaching clients for 40 years to reach their highest potential. Are you seeking transformation, calming of the mind, career happiness and success, and body-mind-spirit wholeness and wellness? I guide you to identify the perfect career and demographic as well as branding and marketing in one-on-one counseling. Want group training, and transformational speaking? Let's get you beyond your wildest dreams! I have been a professor of Meditation and Holistic Health for 41 years. Over the last two decades I have taught in Europe, Peru, Jamaica, Mexico, and the United States and to students online internationally. 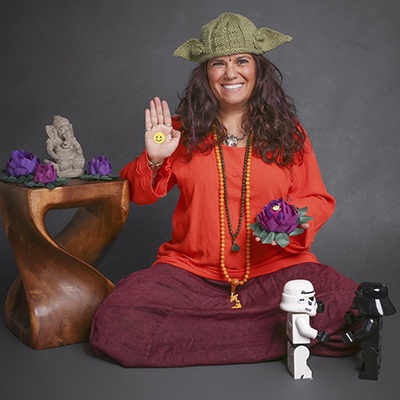 I give clients vital information on core topics of: Meditation, Relationships, Holistic Health, Career Success, and Happiness. I am currently wrapping up my PhDc research on primordial sound and meditation. I received my MA in Yoga Vedanta Education title योगशिक्षा Yoga Shiksha in 2012. I have written and published a major in Meditation for the Grey School of Wizardry where I am the Dean of Psychic Arts. 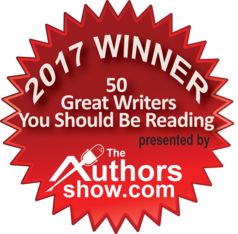 I was named one of the the Top Fifty Authors You Should Be Reading by the Author's Show in 2017. 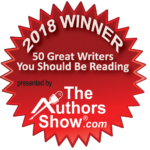 In 2016 I won the Top 10 Writers of the Treasure Coast. 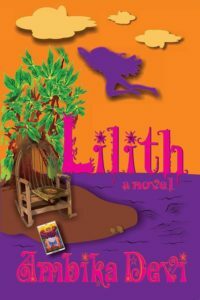 My first novel Lilith, published by my company Mythologem Press, won Finalist/2nd Place in the 2015 International Book Awards for New Age Fiction. 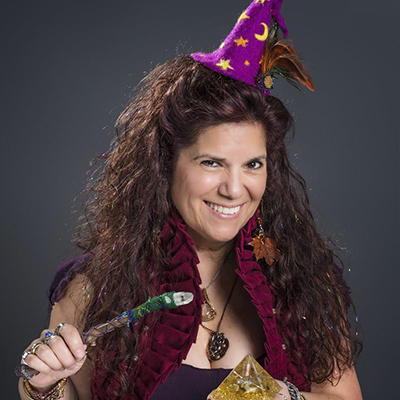 My specialty topics include: Meditation, Metaphysics, Energy Anatomy, Astrology, Divination, Mythology, Lore, and Writing. I am an expert creator of curriculum and brilliant advisor and mentor for Yoga-Samskrutham University. A collection of poetry, art, and photography sure to ignite your senses by Ambika Devi and Dominic Albanese. 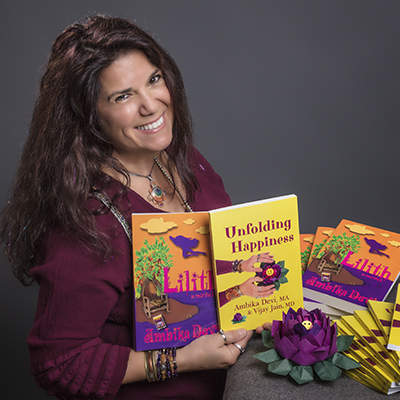 Unfolding Happiness is a beautiful introduction to Ayurveda. In it, Ambika and Vijay share their heartfelt stories and guidance that lead you to a state of happiness and understanding what healthy truly is. This knowledge blossoms forth through the wisdom of Ayurveda and her sister sciences of Yoga and Meditation and our cosmic connection to nature. In this Mystical trip through dreamscapes and the streets of South Philadelphia, we follow a feisty heroine as she engages in conversations with her guardian nature spirits, has flashbacks about her family and realizations about relationships and love. 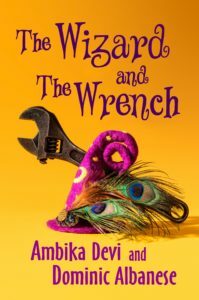 Ambika's winding tale, teaches you the great mystery teachings of the Vedas that give our lives purpose! 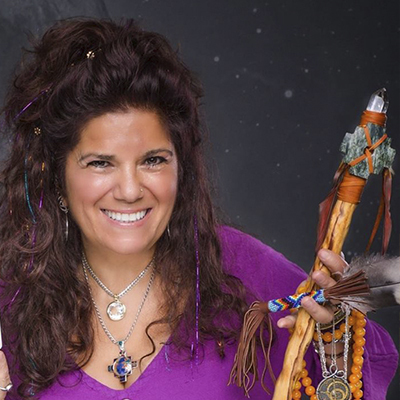 As a Master Astrologer I have worked for the JW Marriott Revive Spa in Scottsdale, Arizona, appeared on TLC The Learning Channel as a relationship expert, and guided a sales team for IBM over the course of six years. I advise high profile clients from around the globe and make regular radio and TV appearances.